Unsupported Block Elements. All block elements included in table cells are ignored. The content will still be displayed but you won’t be able to directly style the elements using CSS (you can still apply styles to the table cell directly). Autosizing. On a website, if a table is too large for its container it might overflow outside it, or use a horizontal scroll bar. Because PDFs cannot do those things it instead alters the column widths and font sizes. Basically, mPDF places more priority on producing a pleasing, efficiently laid out table than it does respecting defined widths and sizes. But there are ways to minimise this effect. 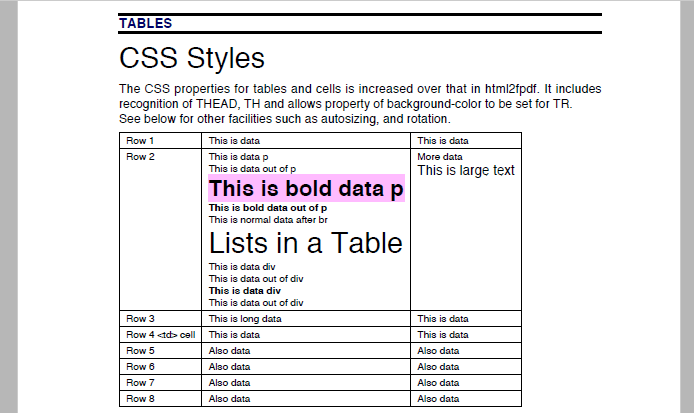 Because of these two issues tables have limited use when designing your PDF layout. We’ve found carefully calculated floats is the better option for producing more complex designs. Use tables for tabular data and you’ll find them a treat. Instead of using pixels or millimetres for cell widths, use percentages instead and don’t add a width to one of your columns. Use a <table> inside your table cell – the HTML becomes complex very quickly so try steer clear. If you do need to add a width to all columns, ensure the column width percentages add up to 100%. Keep in mind the standard box-model applies so left and right padding on your cells should be included in your width calculations. To get around this behaviour don’t add a width to one of your columns so it’s automatically calculated. If a table extends across multiple pages the <thead></thead> and <tfoot></tfoot> elements will be automatically appended and prepended to the table for each new page. Tables can be rotated 90 degrees clockwise or counter-clockwise so they fit nicely on portrait documents. This feature can be applied using the CSS rotate property. We’ve put together a sample showing off the table support in Gravity PDF.